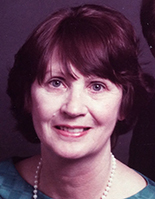 Our mother, Lorna Anderson, born in Mirfield, UK, passed away peacefully in Nelson, BC, on May 14, 2015. Lorna Land met Terry Anderson and they were married in 1953 in England while he was studying at Oxford to be a doctor. They moved to Canada in 1956, settling in the Toronto area for many years. In 1980, they moved to Vancouver and then to Nelson in 2012. She enjoyed tennis, hiking, travelling, reading, gardening, nature and dogs. After moving to Vancouver, Lorna continued her studies at UBC, receiving a BA, and went on to complete a master’s degree in anthropology. She was a member of the UBC Faculty Women’s Club, volunteered at the Museum of Anthropology and enjoyed walks with her husband at Jericho Beach in Vancouver. Lorna is survived by her loving and cheerful husband, Terry; her two sisters, Joyce and Marion of England; and two daughters, Kate and Elaine. Her four grandchildren, Celeste, Cody, Erin and Holly will miss her. She was predeceased by her son, Robert, in 2010. The family would like to thank the wonderful staff at Mountain Lakes Seniors Community for their continuous and loving care. Friends may support their local animal welfare or environmental cause in memory of Lorna.